You are currently browsing the Carpe DMM blog archives for September, 2013. 702.72a Changeling is a characteristic-defining ability. “Changeling” means “This object is every creature type.” This ability works everywhere, even outside the game. For those unfamiliar with the game, it’s a card game, with a bunch of cards that represent various fantastical creatures and magical spells and stuff. The creatures have associated with them one or more creature types, for example: goblin, or dragon, or human knight (2 creature types, it’s both a human and a knight). There is a canonical list of the all the different creature types defined in the game. Creatures can also have abilities on them, which do various game-mechanical things. “Changeling” is an ability. As described by the rule 702.72a, a creature with the Changeling ability has all of the valid creature types in the game. So a creature card with “Changeling” printed on it in its ability box is actually a goblin and a dragon and a human and a knight, and all of the other 220 different creature types currently defined in the game. Well that’s fair enough, this is a fantasy game after all. A creature can be magical and be multiple things at once. The interesting thing is the sentence in the rule that says: This ability works everywhere, even outside the game. So, even if you’re not currently playing a game of Magic, and you have a Changeling card sitting in front of you, that card represents a creature that is a dragon and a goblin and a human… etc. If you accept this statement at face value, it has some interesting philosophical repercussions. What if you have no interest in Magic as a game, but you like dragons and are interested in collecting cards with pictures of dragons on them – Tarot cards, Yu-Gi-Oh! cards, Magic cards, whatever, as long as they have a picture of a dragon on them. You love dragon artwork. Then, because of rule 702.72a and the fact that it applies even outside the game, you must want a copy of Woodland Changeling (shown at right). It sure doesn’t look like a piece of artwork depicting a dragon, but it is. You don’t get to say, “No, that’s not a dragon, I don’t want that card.” If you want to collect all cards with artwork of dragons on them, then you must want to collect this card. Look, the prosecution argues, rule 702.72a clearly states that even outside the game, a Changeling card represents all creature types, and is therefore a dragon. Ergo, the card depicts artwork of a dragon! Motive established! That’s ridiculous, opines the defence. You cannot seriously argue in a court of law that a game rule establishes the motive of my client to murder someone in order to gain a card for a game he is not even interested in, by establishing that the artwork on the card of a bipedal, wingless, humanoid creature is defined as being artwork depicting a dragon! The prosecution calls an expert witness, Matt Tabak, Magic: The Gathering rules manager at Wizards of the Coast. He swears under oath that rule 702.72a defines a Changeling to be a dragon, and that this definition applies even outside the game of Magic. A person’s fate rests on this! Now, obviously this is an incredibly contrived discussion, but it was all brought about by pondering on the implications of making such a rule. Before anyone makes the point, I’ll acknowledge that the rule is written that way specifically to allow things like building decks of cards with which to play Magic – an activity that falls outside the playing of the game itself. For example, if you want to build a deck with 20 dragons in it, you are allowed to put in 18 actual regular dragons, and a couple of Changelings. That’s allowed, because of the rule. I spent the day today at Brookvale Public School, in northern Sydney. 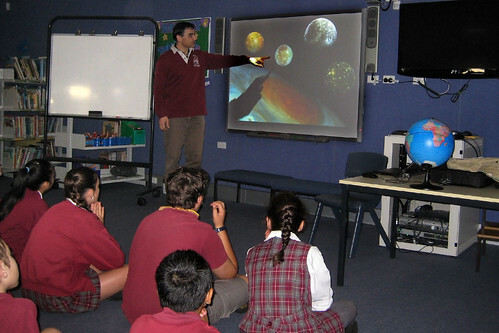 It was a visit as part of the CISRO’s (the Australian government research agency) Scientists in Schools program. 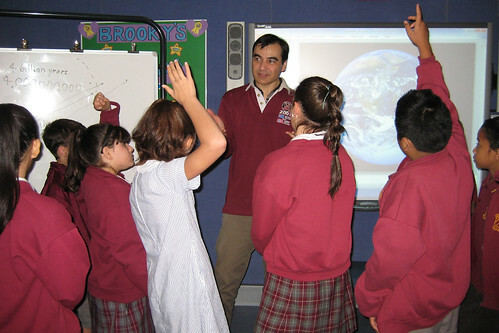 Working scientists get teamed up with school teachers and organise various programs together. With my relatively limited time, I found a teacher who was okay with a fairly low-key arrangement, in which I visit the school a few times a year and talk to the kids, showing them some cool science stuff. Today was my first visit! I put together a slideshow about astronomy, starting with planets and moons, and heading towards stars near the end of what I’d prepared. The teachers set me up in their nice new library, and brought various classes in throughout the day for me to talk to. It started at 9am with the oldest kids in the school, years 5 and 6 (ages 10-11 or so). They were very attentive and well behaved, and were clearly bursting with questions at various stages. I showed them the planets stuff for about 45 minutes, and got on to the very start of the material about stars, showing them how spectral lines let us see what stars are made of, and that our sun is a star. Then we had 15 minutes of questions. Some of the things they asked were very deep and took a bit of explaining to answer! Next was the year 1 and 2 classes (6-7 years old). This was slightly trickier, because I had to adjust my vocabulary more to fit their comprehension. Also, this school has a lot of kids from recently immigrated families, and who are learning English as their second language. After an hour with them, it was recess time! I haven’t had recess for years! The next session was with years 3 and 4, and then after them was kindergarten! These sessions were a bit shorter, about 45 minutes each. I think that was enough for the little ones – they were a lot more excitable and broke into chatter a few times. I was glad the teachers were there to calm them down! For the year 3 and 4s, I did a straight 45 minutes of presenting slides and talking about them, with no room for questions. This was because they had a second session with me after lunch, entirely for questions, because they are currently doing a science project on space. I took a well-earned breather at lunch, and then it was a full hour of answering questions from these excited kids. The slides I showed were mostly images of planets and moons, both from telescopes and also various space probes. I also showed them some of the scientists who discovered various things. I included plenty of females: Annie Cannon, Linda Morabito, Carolyn Porco – in fact I mentioned more female scientists than males – to make sure the kids got the chance to see that girls can be scientists. The questions were widely varied. One boy had obviously been reading up on things, because he asked me about the metal snow on Venus(!). One of the kindergarten kids had the cutest question, when I mentioned that Mars was a bit like a desert here on Earth, with no trees and no water, and she asked if it had camels. It was a little exhausting, having to talk and think on my feet for a full day with a bunch of excitable kids, but it was a fantastic experience. I’m planning on another visit to the school later this year. I don’t know what I’ll talk about then – I need to work that out with the teachers. But I’m sure it’ll be fun!